I am of the opinion that before I can call myself a 'knitter', I need to experience all aspects of knitting - be it socks, sweaters, scarves, fair isle, whatever....Every now and then there is a knit that drives me crazy. 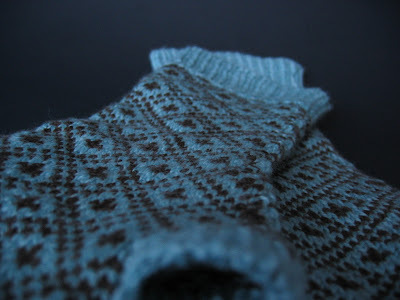 I started these endpaper mitts back in late January or early February….I finally finished them. Most knitters arriving at the same level of frustration I did with this knit would have put the knit away. I am obviously one of those obsessed people who cannot ‘put things away’…I must finish them or I need to get rid of them – make them disappear from my vicinity. To illustrate this neuroses let me explain about this sock incident a while back – I knit a sock toe up and hated the way it looked – it did not have that structured shape that dpn socks have – also I did a picot edge and when I cast off, the cast off part was too tight to sew around the picot – anyways, I KNEW I would never knit the next sock - but it bothered me so much to have this orphan sock laying around, that I ended up giving the sock to my local LYS where I purchased the yarn so they could have it as a display sock – I could not stand the thought of frogging the sock or have it laying around. I know – absolutely inexplicable.